November 7, 1991 Earvin “Magic” Johnson made an an­nouncement that shook the world. During a press conference, the Los Angeles Lakers point guard told the world he was HIV-positive. At the time, his wife of two-months, Cookie, had just found out that she was pregnant with their son, EJ. 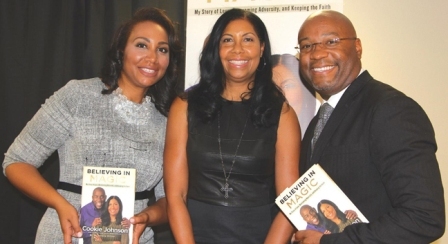 “I had a choice, to leave and let him die or stay and help him live” recalled Cookie during an intimate conversation and book signing at Valencia Christian Center (VCC) for her newly released memoir, “Believing In Magic”. During the Q&A which was moderated by VCC Pastor Marlon Saunders, Cookie gave the congregation a glimpse into some of the non-glamourous but relatable aspects of the last two decades of her life which included her adopted daughter Elisa reconnecting with her birth mother, her son EJ coming out as gay and the launching of her denim line, CJ by Cookie Johnson. In closing the Q&A, Saunders wanted the congregation to revel in Johnson’s testimony. “Most people give up having gone through a lot less” He said. “You all may own half of L.A. now…” Saunders joked, “We celebrate your glory but we don’t know your story,” he added.